There was an earthquake along the New Hebrides Trench this morning (my time in northern California). This earthquake is located deep, possibly below the subduction zone megathrust (but probably is a subduction zone earthquake). The hypocentral depth is 169 km, while the subducting slab is mapped at between 100-120 km in this location. While the slab location has some inherent uncertainty, today’s earthquake is within the range. We probably will never really know, until there is a movie made about this earthquake (surely Hollywood will know). There was an earthquake on 2015.10.20 that has a similar moment tensor with a slightly larger magnitude (M 7.1). There was also a sequence of earthquakes in this region in April 2016 (here is my report from 2016.04.28). I plot the seismicity from the past month, with color representing depth and diameter representing magnitude (see legend). In the second poster, I include seismicity from the past century. In the upper right corner I include an illustration showing how Oceanic-Oceanic Subduction Zones are configured. One oceanic plate subducts beneath another oceanic plate. At some depth, the water dehydrated from the downgoing plate provides the flux for the mantle to melt. This molten mantle rises due to its decreased density, forming volcanoes. These volcanoes form a line subparallel to the subduction zone trench and we call this a magmatic arc, or an oceanic volcanic arc (or simply, the arc). To the left of this schematic illustration is a plot from Benz et al. (2011). This plot shows a cross section of earthquake hypocenters. Hypocenters are the 3-D locations of earthquakes as calculated from seismologic records. This profile F-F’ is shown on the map as a yellow line with dots at the end of the line. In the lower left corner I include two figures from Cleveland et al. (2014). The upper panel show USGS NEIC earthquake epicenters from 1973-2013 and GCMT moment tensors for earthquakes since 1976. There are some regions of this subduction zone that appear to have repeating earthquakes every decade or two (while other parts of the subduction zone do not). The lower panel shows these earthquakes plotted on a space-time diagram (on the right). This plot shows earthquakes with magnitudes represented by the circle diameter, plotted vs. latitude on the vertical axis and time on the horizontal axis. I place a red star in the approximate location of today’s M 6.8 earthquake. (right) Space-time plot of shallow (≤ 70 km) seismicity M ≥ 5.0 in northern Vanuatu recorded in the NEIC catalog as a function of distance south of ~10°N, 165.25°E. (left) The location of the seismicity on a map rotated to orient the trench vertically. Here is the USGS poster showing the seismicity for this region from 1900-2010 (Benz et al., 2011). Below I include the legend (not the correct scale; click on this link for the entire poster (65 MB pdf)). Note the cross section F-F’ which I plot on the poster above. Here is the cross section F-F’ again, with the legend below. Benz, H.M., Herman, Matthew, Tarr, A.C., Furlong, K.P., Hayes, G.P., Villaseñor, Antonio, Dart, R.L., and Rhea, Susan, 2011. Seismicity of the Earth 1900–2010 eastern margin of the Australia plate: U.S. Geological Survey Open-File Report 2010–1083-I, scale 1:8,000,000. Cleveland, K.M., Ammon, C.J., and Lay, T., 2014. 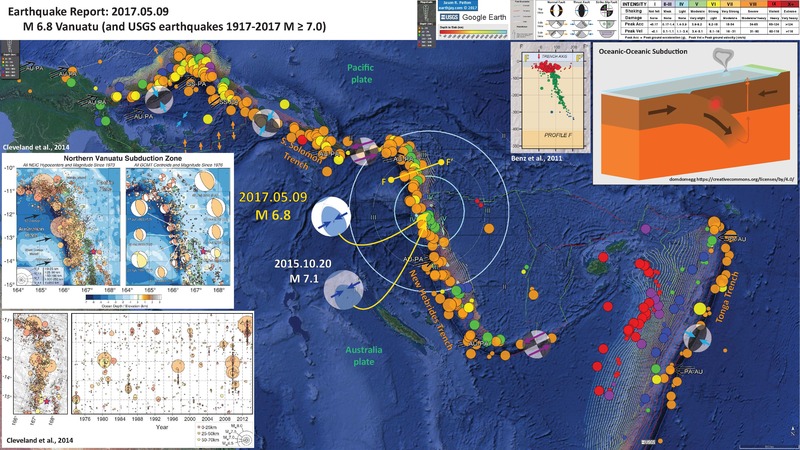 Large earthquake processes in the northern Vanuatu subduction zone in Journal of Geophysical Research: Solid Earth, v. 119, p. 8866-8883, doi:10.1002/2014JB011289. Richards, S., Holm., R., Barber, G., 2011. When slabs collide: A tectonic assessment of deep earthquakes in the Tonga-Vanuatu region, Geology, v. 39, pp. 787-790.